Shifting profits to avoid tax is hardly novel. What is new is that something's being done about it. That's why it's particularly sad when we fall back into the old left/right way of analysing things. There's good and bad on both sides, as this report for the Canberra Times sought to point out . . . The woman sitting on the small podium in the Mural Hall didn’t seem particularly impressed by the speech, although perhaps that’s just my take on her subsequent remarks. Alan Tudge, the Parliamentary Secretary to the Prime Minister, had just launched a campaign by the international anti-poverty organisation, “One”. His speech was filled with all the usual genuflections about the need for change if we’re going to keep up with money-shifting around the globe, attempting to avoid tax. “The reality is”, Tudge said, “that the global tax system hasn't kept pace with the changing nature of business. Over time, gaps and mismatches in international tax rules have led to greater opportunities for tax avoidance.” It was difficult to see what anyone could object to. After all, he was virtually mouthing the organisation’s rhetoric; I could almost imagine Bono (co-founder of “One”) standing next to Tudge, rifting alongside him. “The result” the Parliamentary Secretary continued, “is that some companies with the capacity to shift reporting of profits and expenses across national borders pay little or no tax on their income.” Greens leader Christine Milne shifted in her seat in the audience. Apparently this information was not a revelation to her. Indeed, the majority of the fifty or so in the audience seemed to come from NGO’s or have some other involvement with the developing countries. These are losing more than a trillion dollars in revenue through corruption and tax avoidance, according to “One”. Tudge was working a hard crowd. He decided to persist, finishing on an empowering note. “If ordinary citizens in Uganda can take political action to decrease the proportion of school funding that is misappropriated from 87 per cent to 10 per cent in four years”, Tudge wound up, “people in all developing countries can stop the illegal flow of billions of dollars altogether with the help of the international community.” He sat down to an quick smattering of polite applause. That’s when our host thanked him. She couldn’t resist, however, adding she’d be waiting to see exactly what (if any) action the government was actually going to take to turn the rhetoric into reality. Her implication seemed to be of a huge and growing gulf between the words and the actuality of fighting poverty. Perhaps Tudge hadn’t been urgent enough for her. I was, naturally, very impressed by this fierce level of commitment for the poor, so it was with some surprise I later found that apparently she’d worked for Wayne Swan as Treasurer. He’d crowned “world’s best Treasurer” by Euromoney magazine. Why, I wondered, hadn’t he done anything effective to tackle this issue in six years holding the job? Could someone really be so pure as to definitively assert they held the high moral ground? She disappeared as soon as the speech was over, so I was left to muse by myself. As it happens, Treasurer Joe Hockey has actually introduced measures (not yet legislated) that Swan only talked about. These tackle profit shifting by so-called “thinly capitalized” companies, leaving their debt here but making money overseas. Nevertheless, it’s impossible to fault One’s approach. Take transparency. We should be able to find out if companies like Apple are shifting profits offshore or actually paying tax where the money’s being made (instead of expropriating it to low-tax jurisdictions). If nothing illegal is being done, that’s fine. It’s all part of a much bigger story, one that’s escaped political notice. The seemingly ineluctable flow of money from the pockets of the poor into the wallets of the wealthy. Oxfam insists the 85 wealthiest people in the world have as much money as the poorest 3.5 billion – the top one percent possess 65 times the amount the poorest half own. This is where it starts to become complicated. Everyone’s outraged when a multinational nominally bases itself offshore to avoid tax. Nevertheless, there doesn’t appear to be any desire, from either side of politics, to stem, for example, the flow of millions of Papua New Guinea Kina that are pushing up Queensland property prices. Or the use of Australian banks as safe-havens for storing overseas assets. 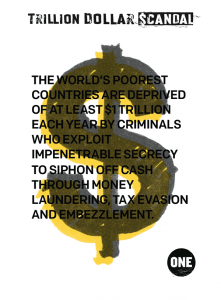 There’s no need, of course, to examine off-shore money-flows to witness inequality and inequity. This is where the excuses of the political class ring so hollow. Tax exemptions exist to encourage particular investments and facilitate business - fine. Unfortunately every time an artificial immunity from paying excise is created it distorts our economy. Bill Shorten spent this week being outraged that a quick sleight-of-hand deal saw the mining tax repeal bill slip quickly through the Senate. It’s tempting to join him in asserting miners will be lining their pockets at the expense of your super . . . except this particular ridiculous tax raised virtually nothing anyway. Compulsory super was a great idea, providing a savings bank for Australia and income for people in retirement. But exemptions created a gaping revenue hole through which the wealthy have plunged. This week the Bureau of Statistics revealed that our national income’s actually shrinking. This at the same time that, quite legally and courtesy of our tax laws, money is redistributed to the wealthy. This is the real outrage.